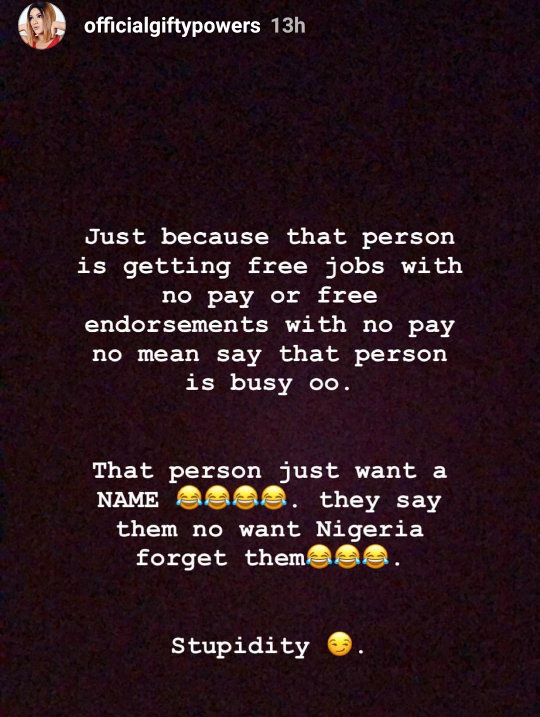 BBNaija reality star Gifty seems to be shading someone and I cant seem to figure out who exactly it is but something tells me she is shading one of the BBnaija reality star...Perhaps the double Wahala former housemates?. Anon 10:26 hatred kill you!! Cee matter will be your end if you don't chill. Drink some honey...why spit such bile? Anon 10:39 at least she's not idle what can be said about you? You are evil. Wait till your loved ones have a health challenge so you can show us the ideal way to go about it. Hello Gifty @ Anon 10:39, hope you feel better??? Anon 10.39 You need to eat a piece of cake to add a bit of flavor to your life. Too bitter! What kinda trauma inducing write up is this? Nina!!!!!. Nina said she had endorsement and she was busy that's why she couldn't take the polygraph test. You are a fool, a big one. That was the day she actually signed that periwinkle estate endorsement. But you wouldn't know because your hatred for her has blinded you. Nina is as transparent as water, she says everything the way it is and if you don't know yet, may that hatred choke you to death. Ozue! Anon 12:11 you are the biggest fool and the bitter one. why? because I didn't insult your loosed nina like mentor like fans fools.And yes Nina is loosed is not an insult it's the truth. fool. Gifty you're so yesterday's news. No matter how controversial you try to be, you'll never blow. I don't understand some people, somebody is hustling hard to make a living & another is trying to kill her morale & efforts by condemning her legit struggle. We all don't have d same destiny to succeed in life, some may not even struggle much & get it right (providence), some thru influence ( man know man or runs) , & some may struggle till grey hairs set in & still remain poor. It's sad that some instead of encouraging others, derive joy in seeing them sad, is that not demonic? Whoever this rubbish of a shade is meant for, just ignore & continue ur hustle pls. 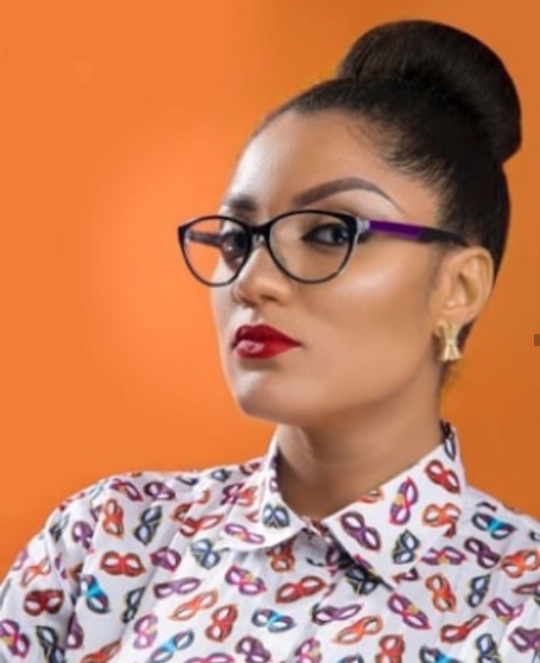 Gift Actually have Mental Problem..
Gifty is gifted in talking RUBBISH and I don't know the kind of mother she would be, Only losers talk the way she talks. Foolish girl.